I wish to share my positive experiences while visiting Samoa: a place where I received warm, efficient and professional care. I am visiting this stunning country from another beautiful island: Tasmania, in Australia. On my second day of a two-week holiday, I fell and broke my leg on the steep track of Mt. Vaea and I could not have received better emergency and hospital care anywhere in the world. 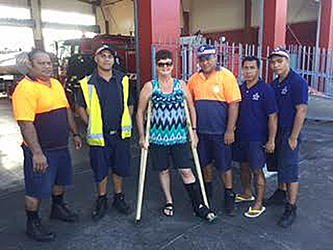 A group of warm, caring, and very strong, Parks and the Samoa Fire and Emergency Services (ALPHA SHIFT) volunteers and staff carried me off the Mountain and delivered me to Apia Hospital. These men were respectful, reassuring and took such care to make the tricky journey as comfortable as possible in very difficult circumstances. Samoa should be proud of these young men and their wonderful attitudes. At the Apia hospital I received professional assessment, care, X-rays and treatment all within a few hours: which was much faster than I would have been treated in most Australian hospitals! All local staff were proficient, communicative and reassuring. I particularly wish to thank Dr. Sebastian Paulo who was patient and communicative. It was also a pleasure to be supported by two charming Irish interns whose caring manner was only enhanced by that stunning Irish humour! I came to learn about this beautiful country – and to swim, walk, dive and enjoy adventure activities. While there will be no adventure for me as I continue my journey in plaster, I have learnt that this is a beautiful, clean, country with a big heart, welcoming people and excellent facilities. We will be back next year to catch up on the activities we have missed and enjoy the climate – and, as importantly, to share the human warmth that Samoa exudes.